E-commerce sites are the most popular websites. It includes several online payments within seconds. That is why these websites require strict security to prevent harmful hacking. 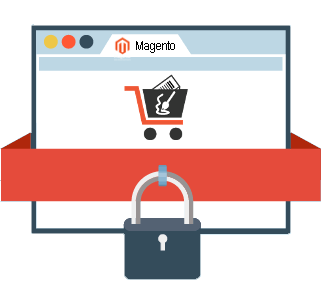 The Magento Website Security protects your e-commerce website. Magento is the most popular e-commerce platform. People choose this platform as it is secure and fast. The e-commerce platform will remain fresh and updated all the time. This platform suits e-commerce sites of all sizes. It will never fail to surprise you. Hence, it actually grows with your business. Another advantage of using Magento is that, it improves the efficiency of your website. It improves the loading speed of your web page. Hence, it helps you to hold the attention of your fellow customers. Magento makes your e-commerce site highly functional. The e-commerce websites are always susceptible to cyber-attacks. The hackers are always ready to hack the entire system. Then they will extract all the personal payment information. That includes the card details as well. Hence, the Magento Website Security eliminates all such security risks. We are one of the reliable hosting provider and solution Integrator. It is mainly because we have a secure software development life cycle. Hence, it makes it easier for us to provide the ultimate security to your website. This is one of the most vital steps. You must always update the software no matter what. You can also apply the security patches as per requirement. All these keep your site on the safe side. You must always follow the update in these techniques.This step will always keep your website away from the hackers or any such crime. It also lets you recognize the symptoms of a cyber-attack earlier. Hence, you can take possible actions. It is no new that shopping online involves risks. But a Secure Magento Website prevents these risks. It lets your clients pay online efficiently. We always tend to update the Secure Magento Website. This is the major step to stop hackers from getting any payment information. Why Choose Simplio Web Design Studio? There are many companies out there, but what sets Simplio Web Design Studio apart is the fact that we have a team of creative individuals who love what they do. We don’t just secure Magento – We ensure that the final product has and added value to our clients and their business. We research, starting from the code, method and even the nature of the protection. We check other methods and other successful systems and make comparisons to make sure that your security is bulletproof. Our team creates concepts that truly embody what your company represents. All these are based on research and creative planning. We offer reasonable rates for our services. We can even customize it based on your needs and requirements. We are highly flexible, making sure that you would be 100% satisfied with the results. Take a glimpse at our Magento security portfolio and you will be amazed at the different websites we secured. Plus, we have a highly experienced team of developers who can create or re-design security system best suited for your company.